Fibber McGee and Molly, Burns and Allen, Jack Benny and others had refined broad character comedy in vaudeville and then did it on radio, but none did it with wife and kids characters, intent on portraying the All-American family like Dagwood and later Dennis the Menace did in the funnies. 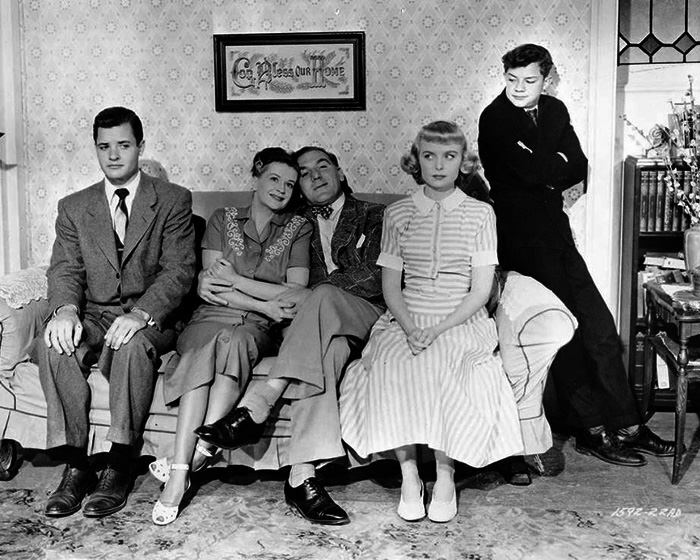 The Life of Riley, and The Adventures of Ozzie and Harriet were old time radio shows written to celebrate the classic American suburban family. The Life of Riley is about Chester A. Riley, an aircraft plant blue-collar worker, his family and their neighbors. 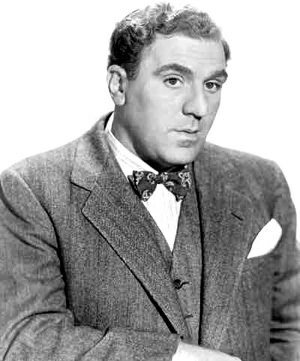 William Bendix took the title role in 1944, after doing mostly heavies in the films. The show quickly grew in popularity in post WWII America, as thousands of GI's were coming home to find work, buy a house and raise a family.Just like Riley. Riley is stubborn and opinionated, and knows his way is the right way. His family and neighbors think otherwise. Peg, his capable and charming wife (in spite of it all), was played by Grace Coppin, and then Paula Winslowe. 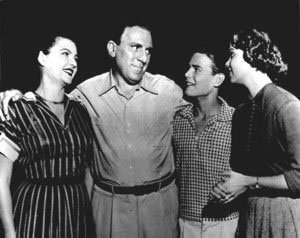 Jack Grimes, Scotty Beckett, Conrad Binyon and Tommy Cook played Junior (Riley's son) through the years, Peggy Conklin, Sharon Douglas and Barbara Eiler was Babs (Riley's daughter). The regulars included John Brown as Gillis, his buddy and Digby "Digger" O'Dell- a pun-loving undertaker that was "creepy" for the kids listening, and a sly swipe at the many "chiller" shows on radio for many adults. Shirley Mitchell was Honeybee Gillis and Francis "Dink" Trout played the wacky Waldo Binny. The idea of a guy getting steamed by the daily grind is still a classic comedy concept, and so is Life of Riley. For more family comedy shows, see also Aldrich Family, My Son Jeep, Ozzie and Harriet and Vic and Sade. My first memory of old time radio (OTR) dates from the mid 1940s. My parents listened to various programs that they liked and, as we grew older, we would listen, too. Some programs I remember from that era were: The Fat Man, The FBI in Peace and War, This is your FBI, the Shadow, The Mysterious Traveler and many others of which I can’t remember all their names. As we kids got older, we discovered programs during the week (after school) such as: Tom Mix, The Lone Ranger, The Challenge of the Yukon, Bobby Benson and his B-bar-B Riders, Roy Rogers and many others. The Lone Ranger was on Monday, Wednesday and Friday at 6 PM. We tried to never miss it. On Sunday mornings most programming was religious or information type programs. My parents were not particularly religious, so they usually left the radio off. My mom would sometimes tell me to go out and chop the head of of one of our roosters and she would prepare him for our noon dinner. Then, we would go into the living room and set the radio on the local Mutual station. Then we would all lie around the living room and listen to: (I don’t recall the exact order) The Shadow, True Detective Mysteries, Counterspy, The Mysterious Traveler, Nick Carter Private Eye and a few others. I’ve spent many a Sunday afternoon that way. During the week we liked (on various days) Judy Canova, Bob Hawk’s Lemac (Camel spelled backwards; the cigarette company), Life of Reilly, Amos and Andy, Our Miss Brooks ( I loved her! She was my ideal teacher! ), Bob Hope, Mr. District Attorney, Jack Benny, Mr & Mrs North, Big Town, Blondie, Edgar Bergen and Charlie Mccarthy, and, I could go on and on. Radio was all we had then. TV didn’t come to Denver until 1952 (I think). And, TVs were expensive and it took a long time before most people had them. Of course we listened on Saturday. Our favorite program was Archie Andrews. And, there was Big Jon and Sparky, Let’s Pretend and lots of others. That day was usually a kid day except during the evenings. So, I have close to 70 years of Old Time Radio Memories! I recently got to think about which might be my favorite program. I made a list of some of my favorites like this (in no particular order): 1. The Whistler. 2. Jack Benny. 3. Our Miss Brooks. 4. Gunsmoke. 5. My Friend Irma. 6. The Life of Reilly. 7. Amos and Andy. 8. The Phil Harris and Alice Faye show. 9. Archie Andrews. 10. Fibber McGee and Molly. I have thought long and hard about it. I currently have 185 OTR programs on CDs and DVDs. I like all of them. But, I have to choose one to be my all-time favorite. I finally selected Gunsmoke.” But, tied for second are the other 184 programs that I have! I love all of them!